Forklift Certification Akron, Get Training in Under an Hour! The city of Akron, Ohio is quickly becoming known as a global hub of innovation. Akron is attracting international companies that are looking for bases involving higher education, healthcare, and public and private organizations. Some of the top industries in the city include plastic and chemical manufacturing, metalworking, motor vehicles and equipment, and machinery. ForkliftCertification.com is a choice forklift training provider for companies all over Ohio, including Akron and the greater Summit County region. With a strong industrial base and close proximity to other Ohio metro areas (Cleveland, Columbus, Cincinnati, and more), Akron has dozens of companies that employ forklift drivers. 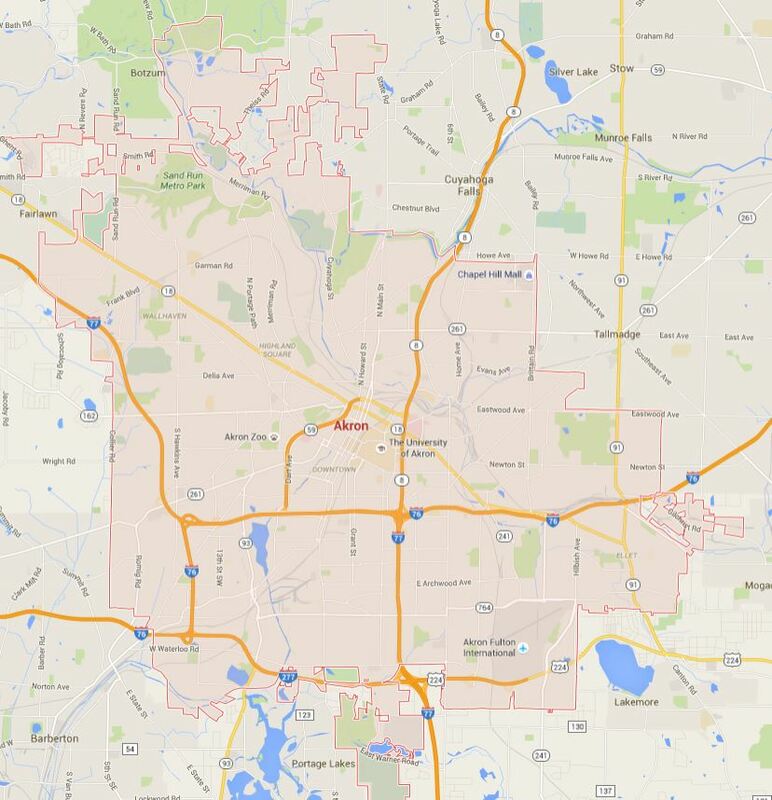 Many companies in Akron rely on forklift drivers to manage and store cargo, construction materials, and much more. With ForkliftCertification.com, Akron forklift certification has never been easier. Since OSHA requires all employers to provide employee forklift training, we’re used by companies all across Summit County for Akron forklift training. But you need forklift training in Akron, and our three training modules can help you become OSHA compliant. Only the best-trained forklift operators have a chance to obtain the best forklift jobs in Summit County. With our complete catalog of training classes, forklift certification in Akron is easier than ever. • Train a Trainer – this module gives an in-depth take on forklift training in Akron. Once complete, you’ll have the ability to train fellow employees on forklift safety techniques and much more! • Bundle Package – combines the first two courses into the best overall value for forklift training in Akron. This is the best Akron forklift training combo package you’ll find anywhere! HOW CAN I ENSURE MY COMPANY IS OSHA COMPLIANT? WITH AKRON FORKLIFT TRAINING FROM FORKLIFTCERTIFICATION.COM! If you’re looking to get involved and qualify for new, exciting jobs in Akron’s top industries, the best way to do so is to invest in specialized education. What is an example of this specialized training? Forklift certification. All of the top industries mentioned above require the skills of those who can operate large equipment like forklifts. Warehouses, airports like the Akron-Canton Airport, and manufacturing companies cannot function without modern day technology, including large equipment to do the heavy lifting and transporting. If you wish to qualify for a new job in any one of these industries and enjoy a pay raise, make Akron forklift certification your top priority. Employers are mandated by OSHA regulations to provide Akron forklift training for all employees. Sign up today and see how we can help! Why is Forklift Training in Akron so Important? Forklifts drastically increase the productivity and speed of a work-site and make many, if not all, of the daily functions possible Uncertified workers also increase the chances of injuries and fatalities occurring on work-sites. Employers are no longer willing to take that risk by hiring uncertified workers that don’t have an operator card, especially now that OSHA has raised its fines to help reduce the number of annual injuries. A safer workplace begins with forklift training in Akron. Contact ForkliftCertification.com today! How Can I Obtain Forklift Certification in Akron? Just because forklift certification is so vital to workers and the workplace doesn’t mean it has to be complicated or expensive. ForkliftCertification.com offers the most convenient Akron forklift training around. The online program takes only about an hour to complete and covers everything workers will need to know to operate forklifts safely–covering warehouse forklifts, order pickers, pallet jacks, and rough terrain lifts. Our Akron forklift training costs $299, offering workers comprehensive, OSHA-compliant training at a fraction of the price of other training programs. And you don’t even need to travel to an off-site facility to complete your certification because you can access our program wherever the internet is available, 24-7. It couldn’t be any easier to obtain your Akron forklift certification and qualify for numerous job opportunities. 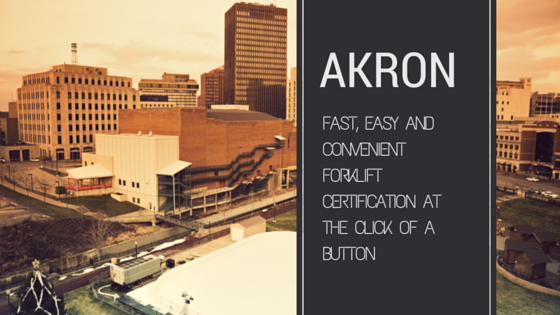 Sign up for a package that works best for you to get your Akron forklift certification today! Give our forklift certification in Akron a call today at (888) 278-8896, or click here to get started today with a training program of your choice! Remember, forklift training in Akron isn’t just nice to have – it’s the law! Contact ForkliftCertification.com today for the best forklift certification in Akron. We look forward to hearing from you – and thanks for visiting ForkliftCertification.com!